The history of Stankela goes back officially for 50 years and is based in a 400 year-old home in Međugorje literally right next door to the winery, AG. They produce about 30,000 liters from two hectares of land, with Stanko (thus Stankela) Vasilj at the helm, who is quite a character. Even with the common family name (which does admittedly sound odd in English), the folks at AG and the ones at Stankela claim no relation despite the coincidence. 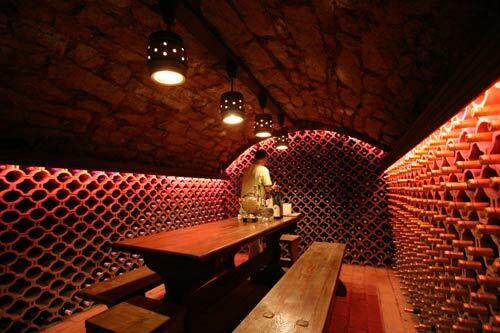 The winery has a proper tasting room, as well as a private tasting room that is most likely one of the most photographed wine-related spots in Herzegovina due to its unique, ‘wine discotheque’ look. The Žilavka has a nose with strong melon and soft summer fruit aromas. The body is clean with a bit of peach as well as pear to it. The finish is a slight bit dry and tannic. It’s a white that really needs to be chilled for proper enjoyment. The Blatina has a very grapey, syrupy nose to it with a good deal of jam. This jam element carries in to the body and gets a good dose of mineral tones as well. The finish comes out dry with a tinge of tobacco on it that might speak to some, but not to others. You can read more about Herzegovina wines in our guide that talks more about other wineries in the region and the quality bottles that they’ve been producing year after year.